One of the best things about being a homeowner is that you can make your home truly yours. You can paint, accessorize, and customize it until you achieve the exact look you want. Why should your fence be any different? At Future Outdoors, our vinyl fences are extremely customizable, so you can achieve the perfect look for your home. When we say our fences are made of vinyl, many people think plain white vinyl siding on cookie-cutter houses. But that image couldn’t be farther from the truth. Vinyl fences from Future Outdoors come in a rainbow of colors to match the style of any house. For vinyl traditionalists, we have classic vinyl colors such as white, tan, and khaki. These vinyl fence colors look great with any style of home. They’re easy to care for and require virtually no maintenance. Plus, the colors won’t fade over time with sun exposure or weathering. Vinyl fences retain their good looks years longer than wood. However, some people want the classic look of a wooden fence. For these buyers, Future Outdoors also stocks a line of wood-grain vinyl fences that simulate the look and feel of wood without any of the disadvantages. These fences have similar texture to wood, and come in colors such as Redwood, Chestnut Brown, and Weathered Cedar. With these fences, you truly get the best of vinyl – durability, strength, and ease of maintenance – combined with the classic good looks of a wooden fence. Privacy Fence: The classic standard fence. This is a true six-foot-tall fence (or taller, if you wish), with no gaps between slats or panels. 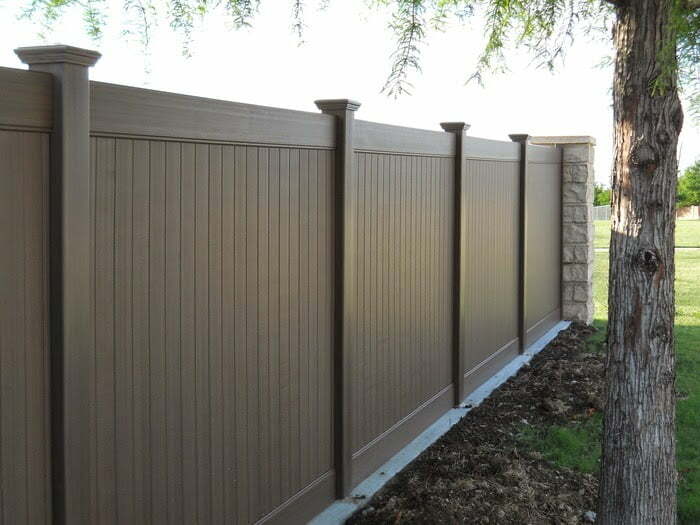 Vinyl privacy fence is the perfect complement to any home. Semi-Privacy Fence: Tall and secure, but with spaces between vertical fence pieces to allow limited visibility from the outside. This is a great option for homeowners that want security without closing themselves off. Picket Fence: Picket fences are shorter and don’t offer much privacy, but they can still keep your yard or pool secure and serve as good barriers between areas of your property. Ornamental fence: Perfect for completing gardens and landscaping projects or keeping pools and lawns secure for kids and pets. Ornamental fences are similar to picket fences, but with an extra decorative flourish. Ranch Rail Fence: Classic horizontal-rail fence perfect for enclosing large stretches of property. Vinyl ranch rail fences combine timeless style with functional strength. No matter what kind of home or property you own, Future Outdoors has the perfect style of fence for you. Alongside colors and styles, Future Outdoors’ vinyl fences are also customizable with a wide range of secondary options. These additions let you make your fence unique and special. First, many fences are available with accents at the top to allow some small visibility and change the visual appeal of the fence. These accents come in a range of shapes and sizes, so you’ll be sure to find one you like. Our fences can also be equipped with electrically-power or solar-powered lights. These lights mount on top of the fence posts to provide visual interest and light the way in the dark. You can even get them mounted on gate posts to eliminate the need for a second light by your fence gate. Finally, Future Outdoors can install a number of different gate styles in your vinyl fence. This includes both walk-through and drive-through gates of varying sizes. Each gate can be matched to the vinyl fence itself, and we can even do custom builds and designs to ensure your gate is completely your own. If you’d like to know more about any of these vinyl fencing options and how they can help you create your ideal home, contact us today at Future Outdoors, LLC. We’re a full-service vinyl fencing company, and we want to make your home the home of our next fence. Contact us online today, or follow us on Facebook and Twitter for more details.